Stop me if you’re heard this one: you’ve got an app you love to use, one with excellent features and snappy response time. But every time you go to open in, you just shake your head and wonder what the developer was thinking when they were creating that icon. Some of us hide ugly icons in folders, just so we have to look at them less. But there’s another way, a better way. We can replace that icon entirely. And you don’t even have to use a fancy theming launcher. You just need Awesome Icons. Awesome Icons is a simple app with a simple premise: it’s a shortcut creator. You pick an app, an icon, and a label, and Awesome Icons creates a new app shortcut on your home screen to use instead of the one you’d find in your app drawer. The shortcuts can then be moved around to your intended place on the home screen, even folders and docks. When you open the app, you’ll see a list of your installed apps, and under each app will be a carousel of different icons available for that app from installed icon packs. If you tap on one, it’ll bring up the shortcut creation screen, where you can see what app you’re linking to, the icon you selected, and you can change the label to read something other than the default app name. Once you hit OK and go back to the home screen, there’s a shiny new shortcut waiting for you. For your theming convenience, you can dim the rest of the screen except the icon, which can be useful in selecting icons for a dark theme or for weeding out icons with a lot of white in them that may not be as visible in the normal view. If you want to create a shortcut with a different icon than the ones in the carousels, you can tap the + in the top bar to open a blank custom shortcut. Select any app and icon you like, change your label as needed, and then it’s ready to for your home screen. This is also a good tool for hiding apps that you may not want other people seeing on your home screen, like a banking app or your adult apps. While you can use this to theme every icon on your home screen in launchers that don’t work with icon packs — or don’t work with icon packs from the Google Play, like Samsung TouchWiz and HTC Sense — it can get time-consuming. I still recommend using a launcher that supports icon packs before using Awesome Icons to replace them all. Also, these shortcuts won’t change the icon in your app drawer, but at least you can have beautiful icons on your home screen. And if you have beautiful icons on your home screen, you won’t need to seek out the ugly icon in your app drawer as much. 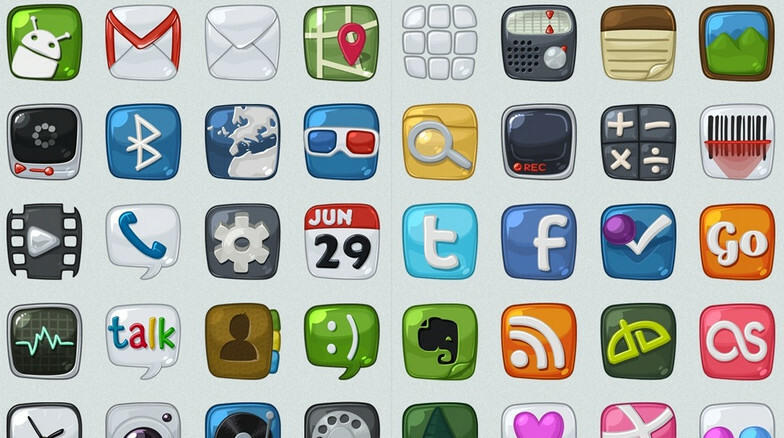 What app icons do you want to hide?